SIMPSON BAY, St. Maarten (March 9, 2018)- - “A strong link between St. Maarten and Nevis is rather important; there are lots of people who go to shop there for business,” said Greg Phillips, CEO of Nevis’ Tourism Authority at a meeting he hosted last week on Nevis with a delegation of the Princess Juliana International Airport, headed by its Chief Operating Officer (COO) Michel Hyman. According to Hyman, the purpose of the meeting was to reactivate the Air Service Development Committee (ASDC) which has been dormant for some time now. The ASDC consists of hub partners Nevis, Anguilla, French St. Martin, St. Barths, Saba, St. Eustatius and Tortola with the aim of jointly securing and maximizing air service to the various islands with St. Maarten as hub. Nevis has been advocating the reactivation of the group. For his part, Hyman shared updates about the SXM Airport post-Irma recovery plans with the Nevisian authorities. This included the various phases of recovery, rebuilding and operations. He revealed that air service to SXM Airport has now been restored to the 70% level post Hurricane Irma. Attending the meeting also was WINAIR’s Marketing Manager, Helena de Bekker who disclosed that the airline experienced a significant decline in flights post-Irma. She announced WINAIR’s new route map and discussed the airline’s flawless safety record. WINAIR provides airlift to many travelers who depend on it for service to St. Maarten. 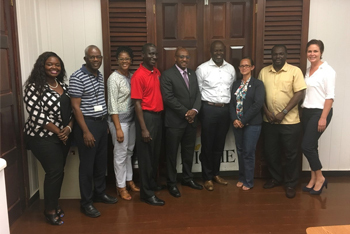 Also at the meeting were John Hanley, Permanent Secretary, Ministry of Tourism, Nevis, Oral Brandy, general manager of Nevis Airport and Seaport Authority and Daron Sutton, Nevis’ acting airport manager.